Just after entering into the web page, we will receive menu with selection of system versions. During work, you can of course switch between them. 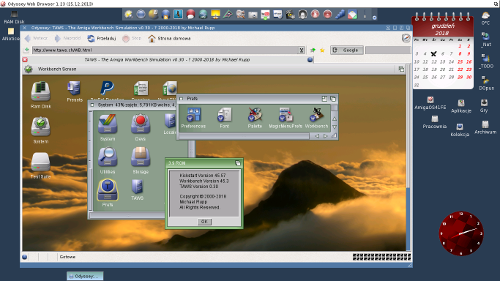 For me it is most valuable part of TAWS - get in into the time machine and take a look how AmigaOS has been changing since version 1.0 until now. 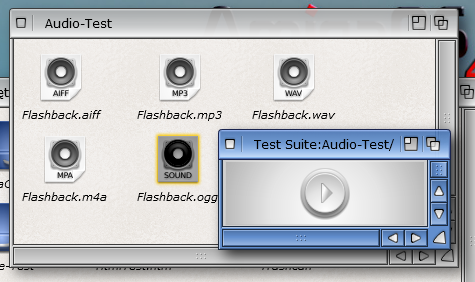 There is pretty nice selection, you can choose between original presets from AmigaOS as well as design of BetterWB or AmiKit. There is no problem to make some experiments by choosing different options from different versions of AmigaOS. It could give us strange effects. We don't have to worry about results. In any time we can just go back to default settings. There are several tools available, including AmigaShell, so we can have fun with commands. Is it serious tool or just a toy? Please judge by yourself. Summary, features if TAWS are just basics. 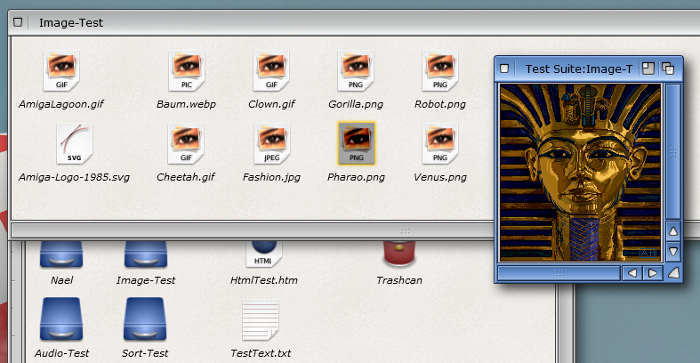 For example we have image viewer. . Mamy np. przeglądarkę obrazków. Since version 0.28 TAWS has also Polish translation. Proper language version should be set automatically during launching (based on browser&#8217;s settings). You can change it of course by yourself using TAWS settings. Despite basic functionalities, I recommend this project to everybody. You should visit web page www.taws.ch, to see there how Workbench could work in the browser. And all that thanks to just one person. TAWS is definitely part of good job. For people, which had no contact with Amiga, it could be opportunity to recognize unknown environment. For Amiga fans it's just adventure in time and good fun.